Dr Mack again led us in the Pledge. Apparently he has to do this until we get it right! President Hunter apologized for having neither a song nor his guitar then sought a thought for the day from our members. Beckie Penman had a good one I recall, but unfortunately that is all I recall. Peter suggested we be generous with the our weekly Food Bank donations as there may be an increase in need due to the Federal Government shutdown. Flash: "Life is a journey not a destination." Thanks, Beckie. No 7AM meeting next week. Members and their friends are encouraged to attend our 5th Tuesday social at Top Golf starting at 5:30 PM. Dan will again send the 2/15/2019 Poker Tournament flyer to all members as apparently some did not receive his first email. Please talk this up among friends and family. RLI this Saturday with Richie and Denise registered. Still time for more to register. Contact John or Randy for details. Mary-Preliminary grant approval for Cameroon! 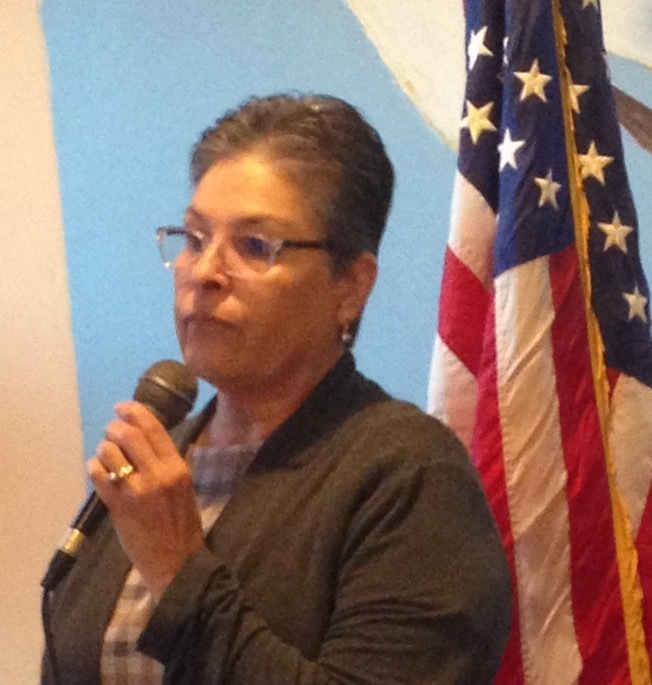 Denise-Happy for today's speaker, Edna Rosas-Gutierrez. Maeve began with lawyer trying to take advantage of old person. (Maeve apologized to David then continued). Lawyer says "I 'll ask you a question and if you do not know answer you pay me $5. Then you ask me and if I do not know I will pay you $500." Old guy agrees. Lawyer, "How many miles between the earth and the moon?" Old guy forks over $5. Old guy, "What goes up the hill on three legs and down on four legs?" Lawyer scratches his head. He consults the Internet. Tweets his friends. Finally gives up and gives the old man $500. The lawyer then asks the old guy, "just what does go up the hill on three legs and down the hill on four?" Old guy gives the lawyer $5! Lynne countered with conversation between a "normal" person and a Psychiatrist. "Is there a simple test to determine if a person has mental illness?" "Yes, we tell the tested individual they have a bathtub full of water and a spoon and a bucket and ask how would thy empty the tub." "Ah, the normal person would use the bucket as it is larger/quicker than the spoon, right?" "No, a normal person would pull the plug." "Would you prefer a padded room with a view or one closer to the cafeteria?" Harold won with ticket 121 and lost with the 7 of hearts.